Living the Real Housewives life seems to be full of glitz, glam and plenty of drama, but most of the theatrics are typically reserved for the small screen. 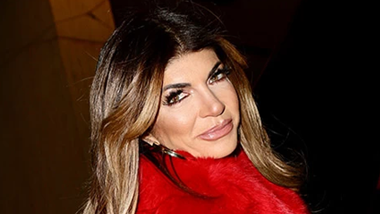 Not so in the Garden State, where Real Housewivesof New Jersey star Teresa Giudice and hubby Joe Giudice have been battling with courts and prison sentences for the past decade. Read on for all of the milestones in their ongoing legal woes, and what might possibly come next for the lavish couple. When cameras first panned over Teresa Giudice in 2009 we met a curly-haired mother of three (soon-to-be four) who ran the household without personal assistants or nannies. She and her construction business owner husband Joe wafted around their $1.7 million, 10,000 square-foot mansion with its double Cinderella staircase and a master bedroom with three walk-in closets and a fireplace. Meanwhile the family vacationed in an equally luxurious second home in Manahawkin Beach. Related: How much are The Real Housewives of New Jersey worth? It didn’t take long for Teresa to become a bona fide series star following her infamous table flip. She parlayed that notoriety into a successful cookbook and subsequent hair and cocktail lines, but behind-the-scenes things weren’t so shiny for the housewife and her hubby. In October 2009 they filed for bankruptcy, claiming they were $10.98 million in debt. 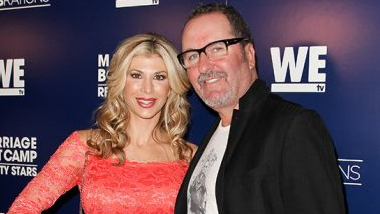 By December 2011 the couple had dropped their bankruptcy petition and cancelled plans to sell their personal effects, but by then they had captured the attention of law officials who claimed the couple failed to disclose a reported $110,000 salary for participating on Real Housewives. Meanwhile Joe was also accused of failing to report $1 million in income between 2004 and 2008. "The indictment returned [by a grand jury] today alleges the Giudices lied to the bankruptcy court, to the IRS and to a number of banks," U.S. Attorney Paul Fishman said in a statement at the time. "Everyone has an obligation to tell the truth when dealing with the courts, paying their taxes and applying for loans or mortgages. That's reality." In total the Giudices were charged with 39 counts of mail, wire and bankruptcy fraud for undervaluing their assets, exaggerating their income on applications, and failing to report their actual earnings. They were indicted on federal fraud charges on July 29, 2013 and each released on $500,000 bail. At the time, the couple’s lawyer stated the personalities would plead not-guilty. In October 2014—five years after first declaring bankruptcy, Joe and Teresa changed their tune and pled guilty, resulting in hefty fines, 15 months in prison for Teresa and 41 months of jail time for Joe. The couple was allowed to serve time separately in order to continue caring for their four children, and so Teresa went first, surrendering herself on Jan. 5, 2015. Meanwhile Teresa fought to vindicate herself in the “court of public opinion” by launching a $5 million malpractice suit against original bankruptcy lawyer James Kridel. As the pair came to an agreement, courts decided 55 per cent of any awards could be kept by the Giudices, and creditors were entitled to the other 45 per cent. While serving her sentence at the Danbury Correctional Facility, Teresa took advantage of the prison’s amenities and started working out up to three times a day. When she was released 11 months later on Dec. 23, she was a Size 2. 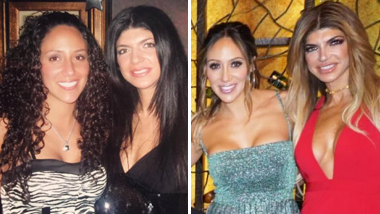 As we’ve seen on the current season of RHONJ Teresa has certainly kept up with her fitness regime, training and even competing in bikini competitions. While Teresa was busy buffing up her body behind bars, Joe was busy making things even more complicated for himself while waiting to serve his own sentence. He was busted for trying to use his brother’s ID to obtain a driver’s license while his was suspended for a DUI. A judge fined him $10,000, took away his license for two years, and sentenced him to an 18-month jail sentence, which he was allowed to serve concurrently with his federal prison sentence. At the time the judge called Joe’s driving record “mind-boggling” (how else do you describe 39 license suspensions?) and said that if the reality star so much as moved cars around his driveway that it would constitute a violation of the conditions of his bail and he’d be arrested. In March 2016—three months after Teresa’s release—it was Joe’s turn to surrender himself for his 41-month sentence at the FCI Fort Dix in New Jersey. Within the first week he managed to get five months knocked off that sentence. While in prison, Joe has kept himself busy by working out up to five times a day, and he’s shed more than 45 pounds as a result. Meanwhile unsubstantiated reports of Joe and his buddies making moonshine behind bars have surfaced, leading some to speculate whether Teresa, who has spoken out about her husband’s alcoholism and the need for him to shape up, will leave Joe once he’s released. The family attorney, James Leonard, has denied all drinking allegations. Whether it’s from the stress of her husband being behind bars or from keeping up with a gruelling fitness regimen while raising four kids, Teresa’s legal troubles have continued as well. Last December she was sued in small claims court by vacation home owners Peter and Donna Ruffini, who claimed Teresa caused $3,000 in property damage and breached their contract when she rented an Ortley Beach property in August. According to the Ocean County Superior Court, the case has since been settled. Joe and his family have since appealed the decision and now they’re at the mercy of the courts. Teresa has publicly said she wouldn’t mind moving to Italy if it came to that, but recently photos of the RHONJ star celebrating her eldest daughter Gia’s 18th birthday without a wedding ring appeared on the star’s Instagram stories, leading some to wonder if the marriage is over. Joe was released from prison March 2019, but wasn’t allowed to return home to his family. After finishing his sentence, Joe was held in Immigration and Customs Enforcement custody, where he’ll stay until he’s deported to Italy. The separation adds further strain on his marriage to Teresa, who made a bold statement on the Real Housewives of New Jersey season 9 reunion show, saying the two will “go our separate ways” if he is deported. While nothing has been confirmed either way, we can’t wait to tune in and see what happens next.